Fantasy is a fiction genre that uses magic or other supernatural elements as a main plot element, theme, or setting. Many works within the genre take place in imaginary worlds where magic and magical creatures are common. Fantasy is generally distinguished from the genres of science fiction and horror by the expectation that it steers clear of scientific and macabre themes, respectively, though there is a great deal of overlap between the three, all of which are subgenres of speculative fiction. In popular culture, the fantasy genre is predominantly of the medievalist form. In its broadest sense, however, fantasy comprises works by many writers, artists, filmmakers, and musicians from ancient myths and legends to many recent and popular works. Fantasy is studied in a number of disciplines including English and other language studies, cultural studies, comparative literature, history and medieval studies. Work in this area ranges widely from the structuralist theory of Tzvetan Todorov, which emphasizes the fantastic as a liminal space, to work on the connections (political, historical and literary) between medievalism and popular culture. The identifying traits of fantasy are the inclusion of fantastic elements in a self-coherent (internally consistent) setting, where inspiration from mythology and folklore remains a consistent theme. Within such a structure, any location of the fantastical element is possible: it may be hidden in, or leak into the apparently real world setting, it may draw the characters into a world with such elements, or it may occur entirely in a fantasy world setting, where such elements are part of the world. Essentially, fantasy follows rules of its own making, allowing magic and other fantastic devices to be used and still be internally cohesive. Fantasy can be distinguished from science fiction, the other genre that it is most often grouped with, in that fantasy includes magic and takes place in a world that could never be, whereas science fiction is generally set in a world that simply doesn't exist yet. The primary distinguishing trait between fantasy and other genres of the speculative fiction type is that the primary focus and story feature of fantasy is magic. For more details on this topic, see History of fantasy. Many works are unclear as to the belief of the authors in the marvels they contain, as in the enchanted garden from the Decameron. Beginning perhaps with the earliest written documents, mythic and other elements that would eventually come to define fantasy and its various subgenres have been a part of literature. Although pre-dated by John Ruskin's The King of the Golden River (1841), the history of modern fantasy literature is usually said to begin with George MacDonald, the Scottish author of such novels as The Princess and the Goblin and Phantastes (1858), the latter of which is widely considered to be the first fantasy novel ever written for adults. MacDonald was a major influence on both J. R. R. Tolkien and C. S. Lewis. The other major fantasy author of this era was William Morris, a popular English poet who wrote several novels in the latter part of the century, including The Well at the World's End. 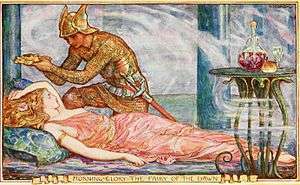 Despite MacDonald's future influence with At the Back of the North Wind (1871), Morris's popularity with his contemporaries, and H. G. Wells's The Wonderful Visit (1895), it was not until the 20th century that fantasy fiction began to reach a large audience. Lord Dunsany established the genre's popularity in both the novel and the short story form. Many popular mainstream authors also began to write fantasy at this time, including H. Rider Haggard, Rudyard Kipling and Edgar Rice Burroughs. These authors, along with Abraham Merritt, established what was known as the "lost world" subgenre, which was the most popular form of fantasy in the early decades of the 20th century, although several classic children's fantasies, such as Peter Pan and The Wonderful Wizard of Oz, were also published around this time. Indeed, juvenile fantasy was considered more acceptable than fantasy intended for adults, with the effect that writers who wished to write fantasy had to fit their work in a work for children. Nathaniel Hawthorne wrote fantasy in A Wonder-Book for Girls and Boys, intended for children, though works for adults only verged on fantasy. For many years, this and successes such as Alice's Adventures in Wonderland (1865), created the circular effect that all fantasy works, even the later The Lord of the Rings, were therefore classified as children's literature. 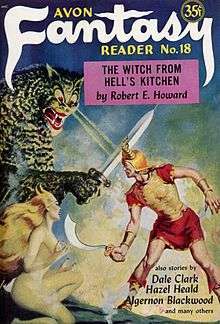 Fantasy was a staple genre of pulp magazines published in the West. In 1923, the first all-fantasy fiction magazine, Weird Tales, was created. Many other similar magazines eventually followed, most noticeably The Magazine of Fantasy and Science Fiction. The pulp magazine format was at the height of its popularity at this time and was instrumental in bringing fantasy fiction to a wide audience in both the U.S. and Britain. Such magazines were also instrumental in the rise of science fiction, and it was at this time the two genres began to be associated with each other. The popularity of the fantasy genre has continued to increase in the 21st century, as evidenced by the best-selling status of J. K. Rowling's Harry Potter series or of George R. R. Martin's Song of Ice and Fire sequence. Several fantasy film adaptations have achieved blockbuster status, most notably The Lord of the Rings film trilogy directed by Peter Jackson, and the Harry Potter films, two of the highest-grossing film series in cinematic history. Fantasy role-playing games cross several different media. Dungeons & Dragons was the first tabletop role-playing game, and remains the most successful and influential. The science fantasy role-playing game series Final Fantasy has been an icon of the role-playing video game genre (as of 2012 still among the top ten best-selling video game franchises). The first collectible card game, Magic: The Gathering, has a fantasy theme, and is similarly dominant in the industry. In a "portal-quest fantasy" or "portal fantasy", a fantastical world is entered through a portal, behind which the fantastic elements of the story remain contained. These tend to be quest-type narratives, whose main challenge is navigating the fantastical world. Well-known portal fantasies include C. S. Lewis's novel The Lion, the Witch and the Wardrobe (1950) and L. Frank Baum's novel The Wonderful Wizard of Oz (1900). The "immersive fantasy" lets the reader perceive the fantastical world through the eyes and ears of the protagonist, without an explanatory narrative. The fictional world is seen as complete, and its fantastic elements are not questioned within the context of the story. If successfully done, this narrative mode "consciously negates the sense of wonder" often associated with speculative fiction. But, according to Mendlesohn, "a sufficiently effective immersive fantasy may be indistinguishable from science fiction" because, once assumed, the fantastic "acquires a scientific cohesion all of its own", which has led to disputes about how to classify novels such as Mary Gentle's Ash (2000) and China Miéville's Perdido Street Station (2000). In an "intrusion fantasy", the fantastic intrudes on reality (in contrast to portal fantasies, where the opposite happens), and the protagonists' engagement with that intrusion drives the story. Intrusion fantasies are normally realist in style, because they assume the normal world as their base, and rely heavily on explanation and description. Immersive and portal fantasies may themselves host intrusions. Classic intrusion fantasies include Dracula by Bram Stoker (1897) and the works of H. P. Lovecraft. "Liminal fantasy", finally, is a relatively rare mode where the fantastic enters a world that appears to be our own, but this is not perceived as intrusive but rather as normal by the protagonists, and this disconcerts and estranges the reader. Such fantasies adopt an ironic, blasé tone, as opposed to the straight-faced mimesis of most other fantasy. Examples include Joan Aiken's stories about the Armitage family, who are amazed that unicorns appear on their lawn on a Tuesday, rather than on a Monday. Additionally, many science fiction conventions, such as Florida's FX Show and MegaCon, cater to fantasy and horror fans. Anime conventions, such as Ohayocon or Anime Expo frequently feature showings of fantasy, science fantasy, and dark fantasy series and films, such as Majutsushi Orphen (fantasy), Sailor Moon (urban fantasy), Berserk (dark fantasy), and Spirited Away (fantasy). Many science fiction/fantasy and anime conventions also strongly feature or cater to one or more of the several subcultures within the main subcultures, including the cosplay subculture (in which people make and/or wear costumes based on existing or self-created characters, sometimes also acting out skits or plays as well), the fan fiction subculture, and the fan video or AMV subculture, as well as the large internet subculture devoted to reading and writing prose fiction and/or doujinshi in or related to those genres. ↑ Saricks, Joyce (2009). The Readers' Advisory Guide to Genre Fiction. Chicago: American Library Association. pp. 265–266. ISBN 978-0-8389-0989-8. ↑ Orr, Cynthia (2013). Genreflecting. California: Libraries Unlimited. p. 273. ISBN 978-1-59884-841-0. ↑ Wang, David Dewei (2004). The Monster that is History: History, Violence, and Fictional Writing in Twentieth-century China. University of California Press. pp. 264–266. ISBN 978-0-520-93724-6. ↑ According to a 1999 survey in the United States, 6% of 12- to 35-year-olds have played role-playing games. Of those who play regularly, two thirds play D&D. Dancey, Ryan S. (February 7, 2000). "Adventure Game Industry Market Research Summary (RPGs)". V1.0. Wizards of the Coast. Retrieved 23 February 2007. ↑ Products branded Dungeons & Dragons made up over fifty percent of the RPG products sold in 2005. Hite, Kenneth (March 30, 2006). "State of the Industry 2005: Another Such Victory Will Destroy Us". GamingReport.com. Archived from the original on April 20, 2007. Retrieved 21 February 2007. Retrieved from Internet Archive 20 February 2014. ↑ ICv2 (November 9, 2011). "'Magic' Doubled Since 2008". Retrieved November 10, 2011. For the more than 12 million players around the world [...] Note that the "twelve million" figure given here is used by Hasbro; while through their subsidiary Wizards of the Coast they would be in the best position to know through tournament registrations and card sales, they also have an interest in presenting an optimistic estimate to the public. ↑ Mendlesohn, Farah (2008). Rhetorics of Fantasy. Middletown, Conn.: Wesleyan University Press. ISBN 978-0819568687. ↑ Mendlesohn, "Introduction: The Portal-Quest Fantasy"
↑ Mendlesohn, "Introduction: The Immersive Fantasy"
↑ Mendlesohn, "Introduction: The Intrusion Fantasy"
1 2 Mendlesohn, "Chapter 3"
↑ Mendlesohn, "Introduction: The Liminal Fantasy"